Why do we treat Suboxone different than Antidepressants? The answer to this is simple: Because we look at addiction as criminal and depression as medical. For the past five years, I’ve worked with clients taking Suboxone. For the two years before that, I worked with clients taking Methadone. 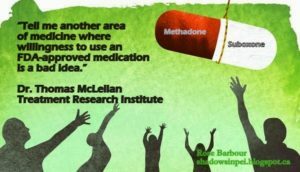 In my opinion, medicated assisted treatment (MAT) is by far the best defense we have against the opioid epidemic. Yet, despite the overwhelming statistics, suboxone remains one of the most stigmatized, misunderstood medications on the market. I am writing this post today to try to help clear up some of those misconceptions. In order to do this, let’s first look at how we treat depression in America. Say you’re feeling depressed. Perhaps it’s been ongoing for awhile so you see your PCP or psychiatrist. You schedule an appointment and sit in a quiet waiting room. No one knows why your there and no one asks. You see the doctor and he or she prescribes you an anti-depressant. You can get your script later that day. You will get no hassles at the pharmacy. No dirty looks from the pharmacist. No one is going to hassle you about pre-authorization. There’s no required counseling. No medication call backs. And no one is going force you to come to a clinic on a daily basis to get your medication. You say, “Okay. Great. That sounds good.” You stay on your anti-depressant and you live a normal, happy life. Now let’s consider the same scenario but with addiction to opiates. You’re struggling with addiction. It’s been awhile so you go see your PCP. He or she can’t prescribe you suboxone so he or she refers you to a suboxone clinic. There’s a waiting list. You continue to use substances while you wait to avoid going through withdrawal, but eventually you get an appointment. You’re getting pressure to taper. Your spouse asks, “When are you ever going to get off this stuff?” You try to taper, but withdrawal symptoms return. Nonetheless, you persist. You eventually do taper off the medication entirely, but all of a sudden and for no particular reason, a relapse occurs. You go back to the suboxone clinic. You feel like a failure. You keep your struggles to yourself. You feel guilt and shame for staying on the medication. The cycle outlined above perpetuates on indefinitely. As a society, if we truly want to say that addiction is a disease, then perhaps we should start treating it like any other medical brain-imbalance disorder. If we really want to curb the opioid epidemic, perhaps we should start treating suboxone, and other medicated assisted treatments, more like anti-depressants.